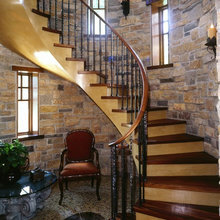 Nationwide curved staircase builder and custom stairway consulting, design, and manufacturing. 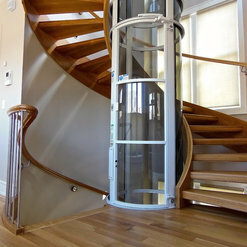 Circular stair experience with extensive variety of components and configurations; spiral stairs; any wood specie; metals; glass; cable; etc. Expert Amish craftsmanship in conjunction with CAD and CNC technology. 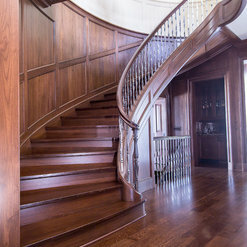 Heartland did three staircases in our new home, including a double curved, black walnut staircase in the foyer of the house. From the moment they arrived for measurements and design consultation, their professionalism and experience showed throughout the project. They were able to create a timeless, elegant entry to our new home. 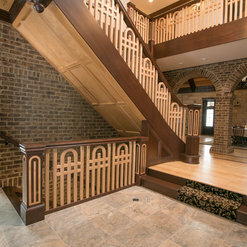 I would highly recommend working with Heartland Stairways. They did an amazing job from start to finish. 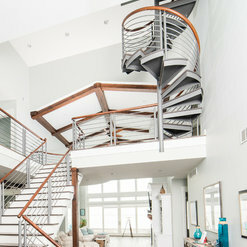 Our Interior Design firm engaged Heartland Stairways to produce and install a contemporary staircase for a Luxury Yacht concept for a lake house remodel on which we were working. 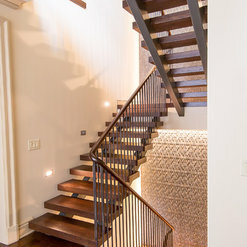 After researching a stair design we came upon an online photo of a spectacular open tread staircase and it happened to be a company right in our region - Heartland Stairways. We met with Delon and Roy and provided the design concept. Heatland created exactly what we had envisioned and much more. What initially was going to be a semi-floating staircase, due to the robust construction methods Heartland uses they were able eliminate the secondary support system creating a truly floating staircase! All along the way, Heartland was very positive. They have a “can do” attitude that is quite rare in our experience. They worked with us to determine the best way to install the staircase, they worked with the materials we specified, and they came up with a magnificent way to shape the treads which resulted in a very aesthetically pleasing outcome. 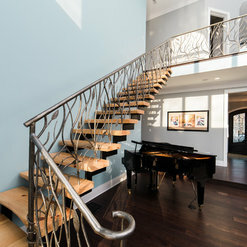 Their in-house metal department produced the stainless steel railing and they fabricated the Mahogany wood handrail as well as the thick Mahogany treads. Their whole professional team from Delon and Roy, to their crafsmen, to their installers - just impeccable! We will definitely use them again on future projects! Thanks David! It has been a pleasure working with you! Your projects have all been very well managed and your staff has been a pleasure to work with. 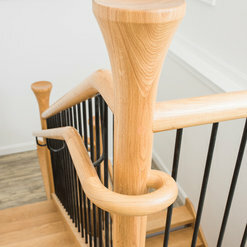 Our Heartland Stairway of solid ash treads and powder coated iron stair spindles swings from the main floor living room entrance to the second floor loft. When outside and looking in at night, I think it is particularly stunning. Because of its understated elegance, it remains the centerpiece of our home. *necessary, useful, and beautiful! Thanks for the review Mickey! Your project was great fun, and thanks to your design direction, it turned out very beautiful. Awesome project! 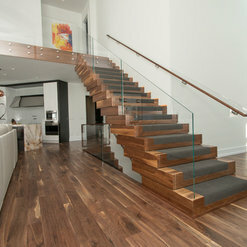 The quality, professionalism and attention to detail of Heartland Stairways is a step above the rest! Always impressed with their honesty and the staff's stair building/product knowledge. They continue to strive to no only improve their products, but the stair industry as a whole. We are proud to be partners of Heartland Stairways. Thanks for the nice review Ed! We feel privileged to collaborate with you on projects in Southeast Florida! Absolutely fantastic company to work with! Attention to detail, professionalism, and honesty are a few of its features. 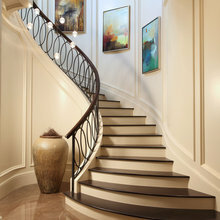 If you have a stairway project, this company will surpass your expectations. Very pleased with Heartland Stairways. Thanks for the nice review Ed! 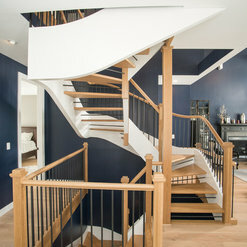 You have an amazing and one of a kind foyer on an awesome property and you made the challenges of some crazy stairs relatively easy to accommodate. It was a pleasure! Thanks Tony! It was a pleasure to work with you on your project and the photos the install crew shared with me look awesome. Love your house and your location! From initial email for information to this week install, I cannot say enough about Heartland Stairways. Ultimate professionals. From design, to measurements to install, every one was a pro. Every subcontractor should be so easy. 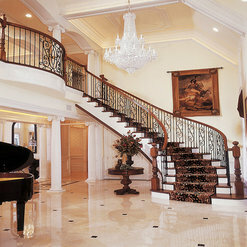 As to the staircase, STUNNING !! Cannot recommend highly enough. As a GC, that's not a minor recommendation. Thanks for the review! This project was a lot of fun to help design and build. Your tastes and input really helped bring everything together, resulting in a fun and rewarding finished product. 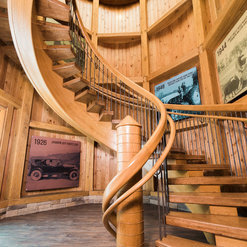 Proud to have been a partner with Heartland Stairways on numerous projects, mainly because their craftsmanship is of the highest level. Many homes we build require a very high level of creativity and thoughtfulness and they've been able to fulfill all of our needs. 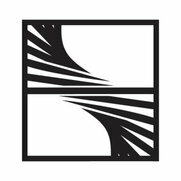 Looking forward to working with the Heartland team in the future. Thanks for the review Brian! It has been a pleasure working with you and your creative, high end projects are always a lot of fun to help design and build. 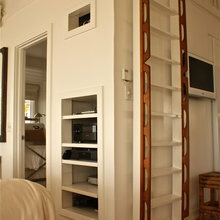 Heartland Stairways has constructed staircases for our new homes and we have a few in the design phase currently. Our field rep has always been very professional, responsive and has outstanding product knowledge. The design team developed a custom design that nailed the look we were going after and the installation was professional and efficient. The end product has always been great. Thanks for the review! We greatly enjoy working with you and your product knowledge greatly helps to deal with layout challenges and developing design ideas. 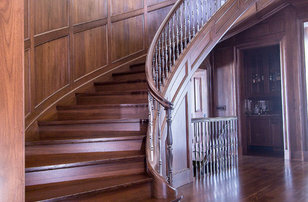 Finest quality workmanship, I highly recommend the team at Heartland Stairways. We have been doing business for many years and will continue to do so. A pleasure to work with. Chris Haas / Haas Brothers Inc. Thanks Chris! It is such a pleasure working with a company that has such extensive product knowledge and support on the jobsite end. It truly is a win-win relationship. Thanks for the review! 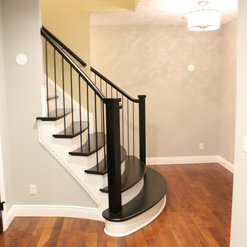 Working with Heartland Stairways was an easy process. Their professionalism and attention to detail was exactly what we were looking for in a stairway manufacturer. I would highly recommend this company. Thank you! It has been a pleasure working with D'Asign Source as well! 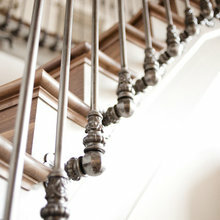 Commented: Who makes these spindles?These are custom made in our iron shop. Let us know if we could provide a quote for your project. Thanks! Commented: Where did you get the railings from?We built everything ourselves. Balustrade components are from various sources. Indital, CR Laurence, and Steiner Glass provided most of the parts. Let us know if we can help you with a project.